Like many bloggers, I often receive offers from companies or people wanting to contribute a guest post here. I almost always decline, because it’s usually someone trying to flog some crappy product or other, with boring writing to boot. But when the excellent and generous Kathryn Elliott of Limes & Lycopene got in touch about the beautiful quarterly magazine she produces with photographer Lucinda Dodds of Nourish Me – An Honest Kitchen – I jumped at the chance. Kathryn is a nutritionist who manages to write about food with generosity and heart. She understands that cooking and eating should be pleasurable, not punitive, and her recipes and advice are always fantastic. She has also been personally generous to me in all kinds of ways so I’m chuffed to have Kathryn & Lucy’s post here – specially as anyone who knows me will recognise that a good roast chook is one of the great joys of my cooking life. Here’s a way to make it just as good but a little better for fitting into one’s jeans. Roast dinners are one of those classic, hearty family meals. However we feel many people now hesitate to make this old favourite. Roasting a joint of meat leads to a lot of leftovers and if there’s only a few of you at home, then making good use of those leftovers can become tedious. No matter how good the original roast, nobody wants to still be eating leftovers four days later. Plus there’s the health factor. The traditional roast, centred on a big joint of meat, with sides of potatoes, gravy and all the trimmings is a heavy, stodgy meal, one which can leave you feeling stuffed and lethargic at the end. If you’re trying to have healthy meals then avoiding the family roast may seem like a good idea. Use less meat: Rather than cooking a whole big joint of meat, choose a smaller cut with a bone in it. This will cook in a fraction of the normal time, but you’ll still end up with a juicy and flavour filled dinner. In our recipe below we’ve used chicken thighs on the bone. Don’t avoid potatoes: Roast potatoes are an integral part of the traditional roast and while the anti-carb movement has left them with a poor image, there’s nothing wrong with a bit of potato. It’s all about the size of the portion you eat and what else you put on your plate. Try to make the potato no more than a quarter of the space on your plate. Be careful with the fat: Traditionally a roast chicken is smeared with butter or another type of fat, which gives a crispy skin but is hell for the waistline. Instead we’ve actually skinned the chicken thighs and then added minimal fat in the cooking. 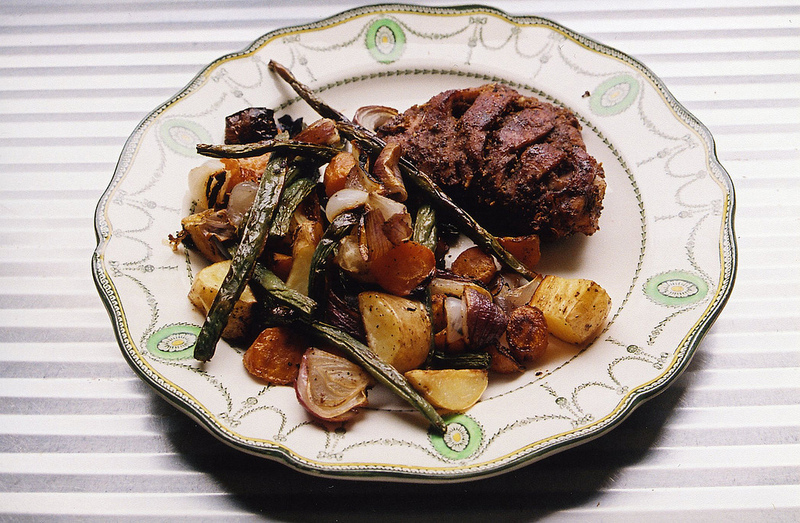 Add flavour: Don’t be afraid to add unusual and strong flavours to your roast, the results can be spectacular. In our recipe below we’ve used Chinese five-spice powder, soy sauce and Chinese cooking wine to produce a roast with a difference. It’s still a roast and still delicious. This was a huge hit with our recipe testers and we’d love to share it with you. 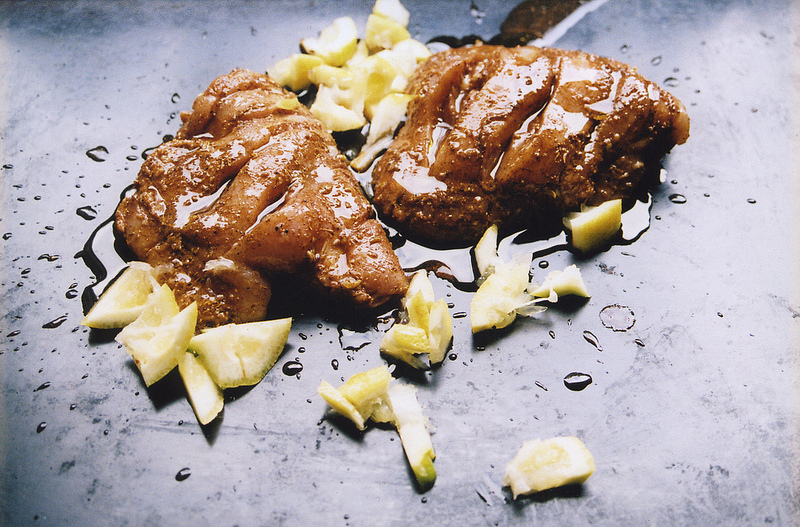 Remove the skin from the chicken: If your chicken thighs have skin on them, then it’s easy to remove. Take hold of the skin at one end and gently, but firmly, pull it away from the flesh. You may need to use a knife to help it along. Cut the chicken skin off, using a sharp knife. Flavour the chicken: Slash the chicken pieces all over, with a knife.You can do this quite enthusiastically, as you want each piece to have several deep cuts on both sides. Place these on a large baking tray. In a small bowl, whisk together the five-spice powder, soy sauce and Chinese cooking wine. Pour the marinade over the chicken pieces and, using your hands, rub the mixture into the chicken pieces. Make sure you push the marinade into the cuts in the chicken and all around the bone. Squeeze the juice from the lemon over the chicken. Roughly chop up the leftover lemon shell and add to the baking tray. Add the potatoes: Cut each potato into chunks, about 4cm in size. Add these to the baking tray. Drizzle over the olive oil. Place the chicken and potatoes in the oven for 20 minutes. Prep the vegetables: While the chicken is cooking, peel the red onion and cut each into 6 wedges. Scrub the carrots and cut into 2cm-ish chunks. Trim the beans. Add the vegetables: After the chicken has been cooking for 20 minutes remove the baking tray from the oven. Turn each piece of chicken and potato over. Add the onion, carrots and green beans. Move them briefly and gently around in the five spice flavouring. Place the baking tray back in the oven and cook for a further 20 minutes. Chinese cooking wine is made from rice and is often called Chinese rice wine or Shaoxing Wine. Taste-wise it’s a similar to sherry, although it has a more bitter, stronger flavour. Some supermarkets stock Chinese cooking wine and it’s also available from Chinese grocers. You can buy Chinese rice wine in many grades and a brand at the cheaper end of the scale is fine for this meal. Chinese five spice powder is a staple in Chinese cooking. It’s a mixture of five spices, star anise, cloves, cinnamon, sichuan pepper and fennel seeds and has a wonderful aromatic smell and manages to be sweet, sour, bitter and pungent, all at the same time. Five spice powder is available from the spice section of many supermarkets. It can also be purchased from Chinese grocers. For more ideas on making over the meals you love take a look at Kathryn & Lucy’s publication An Honest Kitchen: Makeovers. An Honest Kitchen is a regular publication all about real food that’s good for you. It costs $9.95 for 31 pages of beautifully photographed and punchy, nutritionally balanced recipes – in the very friendly PDF format. Each issue is full of simple recipes, practical cooking information and healthy eating advice. The latest edition, Makeovers, in which we revamp popular meals is available in e-format from 11 June. You are currently browsing the How to shuck an oyster blog archives for June, 2013.